Lego Friends – A Success Story For Lego? Although I don’t have solid proof yet, I’m beginning to get the feeling that the Lego Friends theme is one of the year’s most successful toys. As I said, this is just a guess and not to be quoted as fact in any way, but I’m noticing a general mood that kids and parents are embracing Lego Friends in both mind and money terms. As someone who spends an unnatural amount of time thinking about Lego, visiting Lego stores (both online and off) and stealthily over-hearing people’s conversations when they talk about Lego, I’m picking up that the sets are selling very well and both kids and parents are very happy with the quality and overall feel of the designs. Over the last six months since their release, whenever I visit the Amazon Lego bestseller list, at least one (and often more than one) Lego Friends set is in the top 10 selling sets. And that is not just in the US but also in France and the UK. That adds up to a significant amount of sales. I’ve already written a post about growing to love the theme but after building one and seeing others up close I can say that I have fallen head over heels, at least for a few of them (the beauty parlor remains out of my sphere of interest). On the holidays I went to a department store with my kids and we ended up in the toy section – I must be one of the few mothers in the world who avoids the clothes section and drags their children to the toy department. The store had a very large Lego Friends display that included a light-up rotating model of Olivia’s House (set 3315). I had looked at this set before and thought it was pretty cute but when I saw the model in it’s full 360 degree glory I was instantly hooked. I swear I rarely get this excited about a non movie-related Lego set. It was beautiful. Both my son and daughter couldn’t take their eyes off the house and wanted to keep rotating it round and round, to see all the features inside and out. My son, an architect in training whose idea of a great time is to sit and watch Grand Designs on TV, loved all the effort the designers had put into the interior; he especially liked the mixer in the kitchen. My daughter went for the colors and the details in each room – the shower, the beds, the fridge, etc. It really is a wonderful design and for a set that can also be considered minifig scale – it’s one of the best houses I’ve seen for Lego figures to date. I don’t have Olivia’s House yet but it is absolutely on my must-get list (which admittedly is a long list- but this is right near the top). After we returned home I did some more “research” (voyeuristic web-surfing) – Check out this official Lego video made with set designer Fenella. There is something so wonderful about seeing women designing and making Lego for girls. It’s true that not everyone shares my enthusiasm. The larger Friends figures can be a turn off for many people and it is a shame really as they are missing out on some incredible sets. One answer is to buy the sets, turf the figures and simply use regular minifigures with the rest of the set. All the accessories can be held by the normal Lego figures anyway. Others have been turned off by the way the sets were originally marketed and while I think they have a point (to a degree) I am hoping that this aspect of the theme will balance out over time. Lego have obviously put many hundreds of hours of thought into Lego Friends, both into the theme as a concept and the sets themselves. It is clear that Lego Friends is not simply a mini version of Belville which alienated many in the Lego community, and I think did more harm than good with the female market. 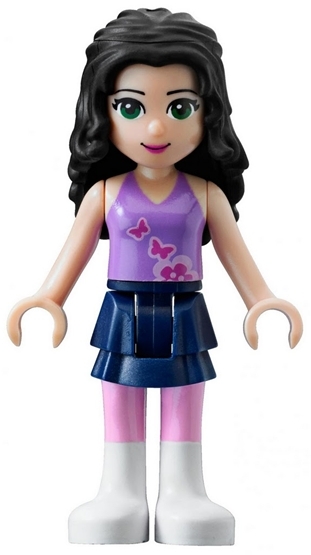 There are more Lego Friends sets coming out mid 2012 and, if the early images are anything to go by the quality of the theme will continue to be very high. Personally I am hoping that Lego Friends is as successful as it seems to be and that we can look forward to many years of these wonderful sets. I know that I will be adding more than a few Lego Friends to my collection and that both my kids will enjoy the thought and care that Lego have put into this controversial theme .